This exhibition surveys the architecture, urban planning, and design work of American architect William L. Pereira through images, models, drawings, and plans. The exhibition re-examines the modest spaces he created early in his career and the large-scale structures for which he is largely remembered. 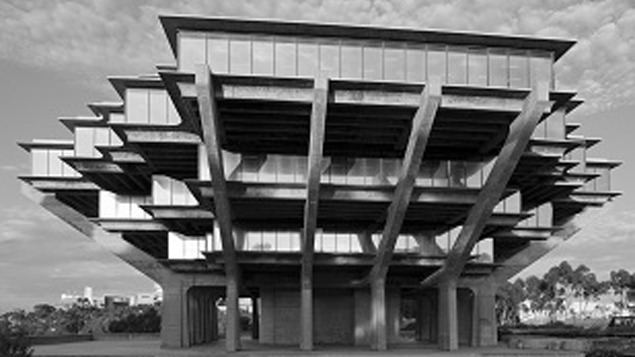 The structures Pereira designed were far-flung and often large in scale, ranging from San Francisco’s iconic Transamerica Tower to the Los Angeles County Museum of Art; the University of California, San Diego Geisel Library to the master plan for California’s Irvine Ranch and the Los Angeles International Airport (LAX); Marineland of the Pacific to Cape Canaveral; a master plan for Doha—the capital city of Qatar—to the National Medical Center of Iran. Pereira became the first architect for the University of California system and master planned and designed many of the buildings for the University of California, Irvine. The purpose of the project is to frame Pereira’s practice within the histories of architectural modernism and southern California in the mid-twentieth century. Because Pereira’s career parallels the arc of modern architecture and its focus on iconic form, the evolution and trajectory of his work sheds light on the closing window of the modern movement. Photography is encouraged in this exhibition. Post and share your images with us on your favorite social sites! Become and Museum fan on Facebook (LINK) and take part in our daily competition throughout August. Answer the question: “What am I looking at?” for the chance to win a prize. A BIG thank you to Scott Mortimore of Mortimore Creative for the images and prose! A fully illustrated exhibition catalogue accompanies the exhibition. The book is introduced by Colin M. Robertson with essays by Curtis Fentress, Alan Hess, Thomas S. Hines, Scott Johnson, Geoff Manaugh, JoAnne S. Northrup, and Elizabeth A.T. Smith. Copies are available for $29.99 in the Museum Store. To purchase a catalogue via phone order, please contact Jackie Clay, Manager, Museum Store at 775.329.3333 ex. 106. This exhibition is originated by the Nevada Museum of Art and curated by Colin M. Robertson, Charles N. Mathewson Curator of Education, Nevada Museum of Art.